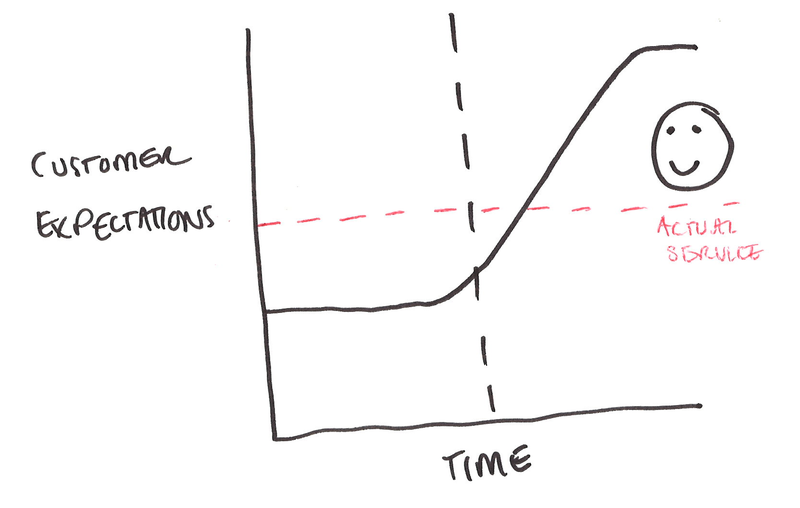 Inspired by Vonnegut’s story graphs, I’ve created some graphs demonstrating different types of experience when signing up to a new service. 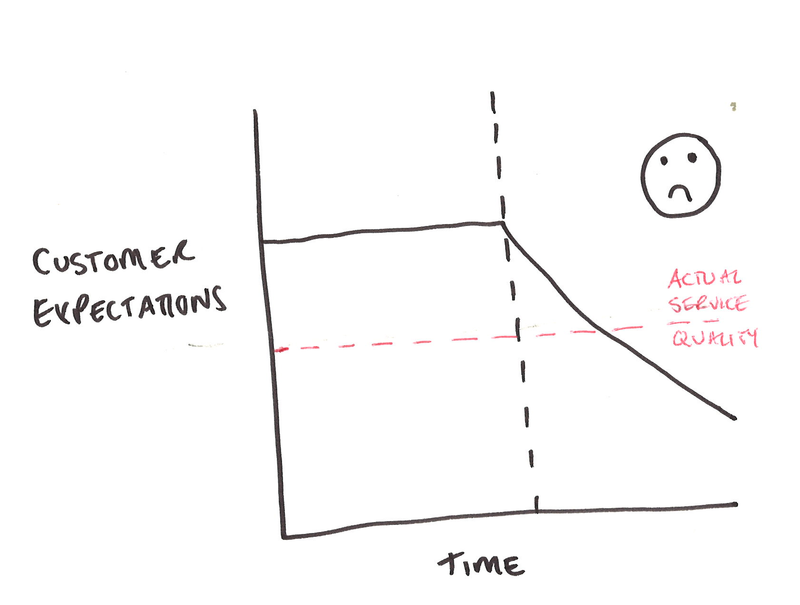 The graphs show expectations set by marketing prior to becoming a customer and the ensuing impact on their satisfaction based on the actual service. 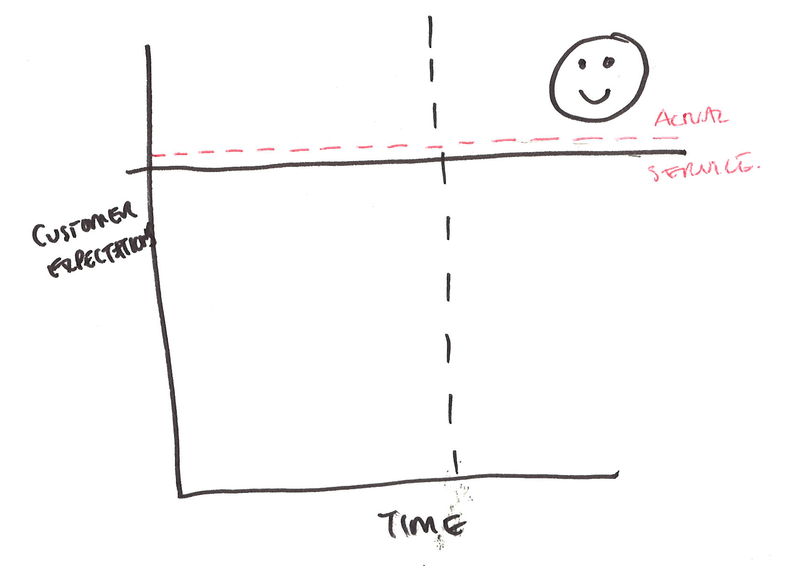 The dotted black line in each graph represents the point at which the person becomes a customer. This is the ideal – high expectations and a comparable service = happy customer. High expectations supported by a high quality service. This is the worst approach – making spectacular claims and setting elevated expectations before, only to disappoint with an average service later. A quick and expensive way to an unhappy customer. High expectations followed by an average or poor service. If the actual service isn’t perfect, deliberately setting expectations low initially can mean customers receive a pleasant surprise when they find the service to be better than that. This is intention behind a beta launch. Again, happy customer (in the short term at least). Low expectations are set. The actual service is better than anticipated. This could be a quick, visual way of assessing a brand’s approach to communications and the subsequent quality of service. It demonstrates the importance of having a joined up approach to a service and its marketing.